Adam Turnbull, a Canadian fisherman, recently caught a fish that was badly in need of help, having spent a lifetime being strangled by human garbage. As of Tuesday afternoon, the post has been shared nearly 13,000 times. 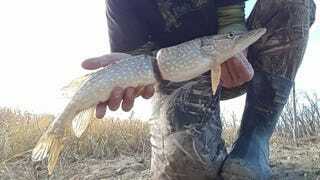 Turnbull told Earther that he caught the fish, which is a pike, near Medicine Hat in southeast Alberta, Canada. He said even though he’d never encountered anything like it before he was able to release the fish after removing the plastic. Turnbull discussed the phenomenon with a biologist, who speculated that since the bulk of the food processing in a pike happens near its front, the fish “could probably still get a full belly” before suffering digestive tract constrictions further along, possibly slowing the digestive process. According to Turnbull, the same biologist speculated that the fish—which is big enough to have few predators (aside from rogue Powerade wrappers)—will thrive in in its new, unrestricted body, having survived so long under duress. Ever since childhood, we’ve been warned not to toss six-pack rings out before cutting the loops open. After seeing what happened to this fish, perhaps some folks will be convinced to go the extra mile and track down the scissors before throwing out our garbage. Making sure to dispose of trash properly will also help keep it out of waterways. Turnbull said that while he hasn’t encountered this problem before, the river where he caught the fish is littered with tennis balls leftover from dog owners when the dogs fail to retrieve the ball. If only we were all better at following through on simple tasks.